^ 前田 1997, p. 8. 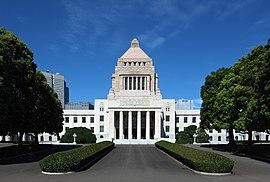 ^ Record of Events on 13 February 1946 when Proposed New Constitution for Japan was Submitted to the Prime Minister, Mr. Yoshida, in Behalf of the Supreme Commander(「1946年2月13日に新憲法案が最高司令官に代理し吉田首相（実際は当時は外相）に提出された際の記録」チャールズ・L・ケーディス大佐ほか作成) "Dr. Matsumoto then said that most other countries have a two House system to give stability to the operation of the legislature. If, however, only one House existed, said Dr. Matsumoto, one party will get a majority and go to an extreme and then another party will come in and go the opposite extreme so that, having a second House would provide stability and continuity to the policies of the government. General Whitney then said that the Supreme Commander would give thoughtful consideration to any point such as that made by Dr. Matsumoto which would lend support to a bicameral legislature and that, so long as the basic principles set forth in the draft Constitution were not impaired, his views would be fully discussed."